History of Mt. Fuji in a 19th-century 3-D map. This woodblock print map of Japan’s Mt. Fuji, which can be folded to represent the mountain’s iconic conical shape, was produced by an unknown publisher sometime around 1848. Writing about the map in the new book Cartographic Japan: A History in Maps, Miyazaki Fumiko speculates that the item may have been printed and sold by oshi, traveling performers and acolytes from Yoshida, one starting point for pilgrimages up the mountain. The map appears in the book with numbers overlaid to denote points of interest. I’ll paraphrase (and sometimes quote) Miyazaki’s explanations, below. 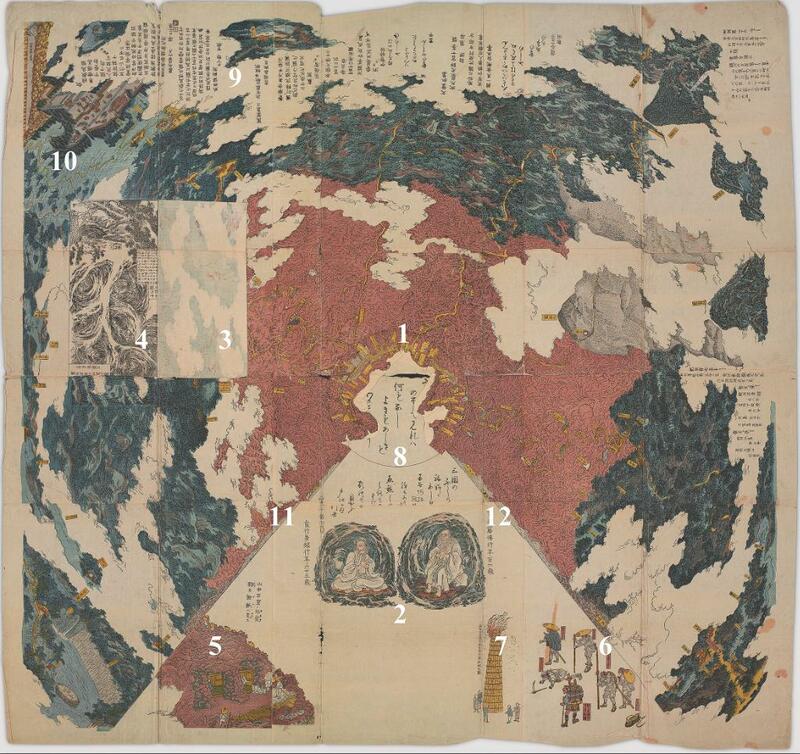 1) In the center of the map the artist has affixed a small piece of paper “on which rocky peaks are illustrated”; “when one pulls it open, the peaks of the outer rim rise up to surround the part of the map that depicts the crater.” 2) The two figures depicted sitting inside the mountain are Kakugyo Tobutso and Jikigyo Miroku, lay aesthetics and “founding figures revered by the Mount Fuji cult.” 3) A rectangular flap covers 4) a “glimpse of a cave network,” which pilgrims would have sought out as part of their religious experience; “the faithful believed that the cave represented a human womb, and that one could experience rebirth by passing through it.” 5) A stone lodge, used by pilgrims. 6) “Pilgrims dressed for climbing.” 7) A torch, like the one lit at the celebratory Yoshida Fire Festival. 8) Poems, “believed to have been composed by Jikigyo,” which formed part of the Fujiko religious ceremonies. 9) Other quotations from literary works. 10) Description and depiction of the Yoshida entrance and the Yoshida Sengen Shrine. 11) and 12) mark the edges of the map that can be folded together in order to form a 3-D replica of the mountain. “Portrayal of Mt. Fuji,” by Utagawa Sadahide, preface by Sawaguchi Seio, 1848; woodblock print, 91.4 x 96.5 cm.